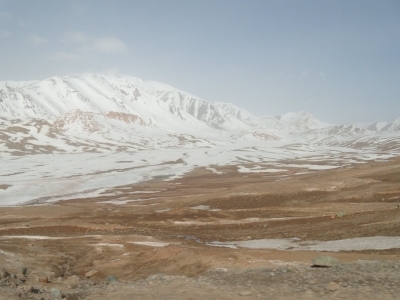 Tajik National Park (Mountains of the Pamirs) covers high mountain ranges with many peaks over 6,000m high. It is a harsh environment covered in snow all year. There are over 1,000 glaciers, 170 named rivers and 400 lakes. The Pamir Mountains are part of the Central Asian highlands, and lie at the center of the 'Pamir knot' where tectonic forces have pushed up the Himalaya, Karakoram, Hindu Kush, Kunlun and Tien Shan mountain ranges. Karakul Lake, one of the highest salt lakes in the world and formed after meteorite impact. Site visited in May 2008, a pretty long time ago, so probably many things have changed and the access to the park could be easier than it was before. I was only in the eastern part of the park. At that time a special permission was needed to enter Gorno-Badakhshan Autonomous Region; this was issued together with the Tajik visa at the embassy in Brussels for an extra fee. After spending few days in Khorog and around, we continued to Alichur where the road to the southern lakes (Yashikul) starts. We have not planned anything before and arranged the transportation in a homestay in the village. It took one long day to go to the lakes and back – of course there are only rough roads there but the pickup we rented with the driver was very brave! It was pretty cold and still some snow around. The third time we crossed NP border was on the way to Kyrgyzstan. We stopped for one night at the Karakul Lake. Our accommodation – military base. From every place in this part of Tajikistan the views are amazing! But you should be very patient! There were organized trips/tours to Pamir even from Murgab where they had a professional tourist agency, but very expensive. Organizing everything by yourself with local people takes time and could be risky but in our case turned out to be funny and rewarding! Fast forward to September 2016 and the Karakorum Highway is now too dangerous a journey and still yearning for one last chance to savor the moment of total isolation and beauty once more and the Pamir Highway is beckoning at me from my atlas. It runs parallel to the Karakorum Highway for about a third of the way in Tajikistan and as a bonus, it runs through the Tajikistan National Park (WHS). I go into full gear to make it and here are a litany of obstacles to consider. First of all, its not a convenient place to get to. Most travellers consider this a trekking destination and plan for a duration of several weeks. Since Mrs. Sun and I are not trekkers, we are looking for a shorter, more comfortable way. The road from the Capital of Tajikistan, Dushanbe to Khorug and then to Murghab is nearly 1000km over very bad roads. I was told that either by your own 4WD or via shared taxis, it would take 3-5 days each way depending on weather and road conditions! From Murghab, its another 400+km to Osh across the Kyrgzstan. This is the section that goes through the core zone of the WHS, including Lake Karakul. The other option which we chose was to come from Kyrgyzstan and cross the border into Tajikistan from the north. Even this will require 3 days to make this trip. The first day was spent driving 4 hours from Osh to Sary Tash in Kyrgyzstan. Sary Tash is a desolate frontier town whose only value is that the roads from Kashgar, China come over the border through Sary Tash. There are no hotels here and the best we could do was a home stay in a farm house for two nights. The rooms are clean enough except that there is no running water and the toilets are an out house, with a hole, 20m to the rear of the building. Even in September, the temperature drops to below zero at night and no one contemplates making an evening visit to the loo. As such after a lot of hand waving, I managed to secure a bucket for our room. Dinner was served in candlelight (electricity is intermittent) and consists of boiled potatoes and a piece of chicken. The second night it was just boiled potatoes. Mrs. Sun was rather unhappy as she did not shower nor go to the outhouse the duration we were there. Also Sary Tash is at 3,200m and during the day we will pass 4,300m so we are popping diuretics. From Sary Tash, its an hour drive to the border with Tajikistan over very bad roads and 4WD is highly recommended. There are shared taxis that ply the route from Osh to Murghab but I should caution that they run very infrequently, the border crossings are difficult and rudimentary Russian is a must to get anywhere. In addition to getting a Tajikistan visa, you need to get a special GBAO (Gorno Badakhshan Autonomous Oblast) permit to travel here. During the frontier crossings, I saw lots of cash change hands including a bottle of vodka. Once you are in Tajikistan, the road becomes gravel and there are points where the roads are washed out with 8 foot drops. You just drive off the road, cross the low water stream and back up again. Its two or so hours before you arrive at the forsaken village of Karakul (not to be mistaken for the huge Karakul lake in Kyrgyzstan). This village started out as an outpost for the soviets to watch their border with China. Since independence for Tajikistan, the Russians are gone together with electricity and all other services. I am amazed anyone survives up here. The landscape here and during the drive is surreal. There is no vegetation at all and the mountains are brown and grey. Snow caps are everywhere and the desolateness is captivating. Then there is Karakul Lake. It’s a dead salt lake that shimmers in the high UV light and looks out of place. There are some salt tolerant grass near the shore and that’s about it. No fish, no birds, (maybe the birds are gone for the winter) nothing. At nearly 4000m, it’s the highest lake in Central Asia and apparently was caused by a meteor 10 million years ago. Many travellers have been by including Xuan Zang, the Chinese pilgrim in his Journey to the West in 642 and he referred it as Dragon Lake. Also Marco Polo was reputed to have been by. We stopped for lunch in a homestay and it is the only place in town as other visitors dropped by (4 Austrain men, 1 Alaskan woman) all with their guides. After lunch we had a pleasant walk along the lake but as the wind whips up, it was way too cold. To cap a very long day, we crossed back the border to Sary Tash. "refocus the nomination and address issues related to the integrity, protection and management of the nominated property"
Lazarus species: Large-billed reed warbler: a warbler rediscovered in Thailand in 2006, previous known only from a specimen collected in India in 1867. A study by Russian ornithologists in 2011 indicated that the species had been misidentified as A. dumetorum in museum collections and that the species may be breeding in Tajikistan, Kyrgyzstan, eastern Uzbekistan and south-eastern Kazakhstan. Nests were found in 2011 in the Panj river valley, Tajikistan.